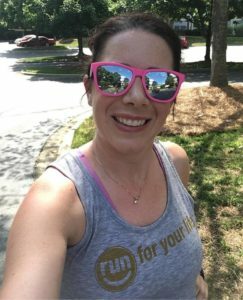 Where do you run: Mallard Creek Greenway primarily. Also Frank Liske Park in Concord. Running Career: 2 marathons, 19 half marathons, 1 sprint triathlon. 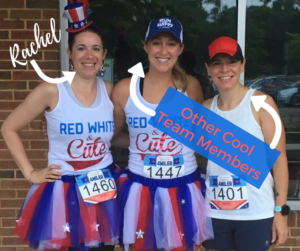 Favorite Local Race: Novant Health Charlotte Marathon Relay – Leg 4. Miles 15-20. Swing in to our University shop sometime soon to say hi to this smiling face. 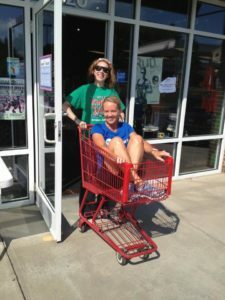 You may get to hear a hilarious story from her tenure in the land of specialty running retail, learn about the next race, or just find out about the workout of the week from the newest gym on the block. Interested in joining our family? Check back soon to meet more of the team or head to our employment page to see what openings we have. It’s hard to beat having a shower at two of our three locations in town when you want to get that shift run in.